“Say it with cauliflowers.” Because I love you, one great cauliflower recipe begets another this week. For a couple years I’ve had a photo I took of a purple cauliflower hanging on the limited wall space of my NYC kitchen. And while I was walking through the farmer’s market this weekend, I saw him again. 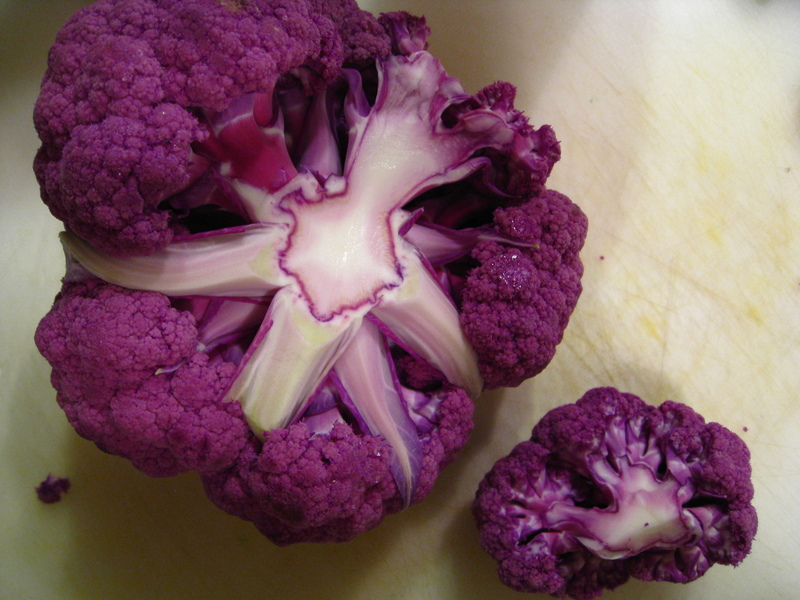 The most stunningly royal purple “graffiti cauliflower.” Let me be clear — this graffiti cauliflower is not purple because of some lame carnation-in-dyed water method, this is the color nature intended! So I bought him, brought him home and consulted one of my favorite food websites Food52 for some inspiration from their week 6 recipe contest: “your best cauliflower recipe.” Just today the recipe below was announced as the winner — and I concur with the crowd! This winning recipe is just another reason to fall in love with cauliflower, and while most people turn the other way from the boring, colorless white cauliflower, let me remind you that this veg is packed with cancer fighting nutrients and vitamin C. So when you can cook up a recipe with lots of other great flavors and find a beautiful variety like this one, you not only create a heathy dish, but one that looks and tastes spectacular. If you can’t get your kids to eat this, I don’t think there’s any hope for them! This recipe is so tasty I recommend following the quantities below so you have leftovers, but you can easily cut it in half if you only want to make enough for 2-3 servings. Preheat oven to 425°F. Trim tough stem and core from cauliflower and discard. 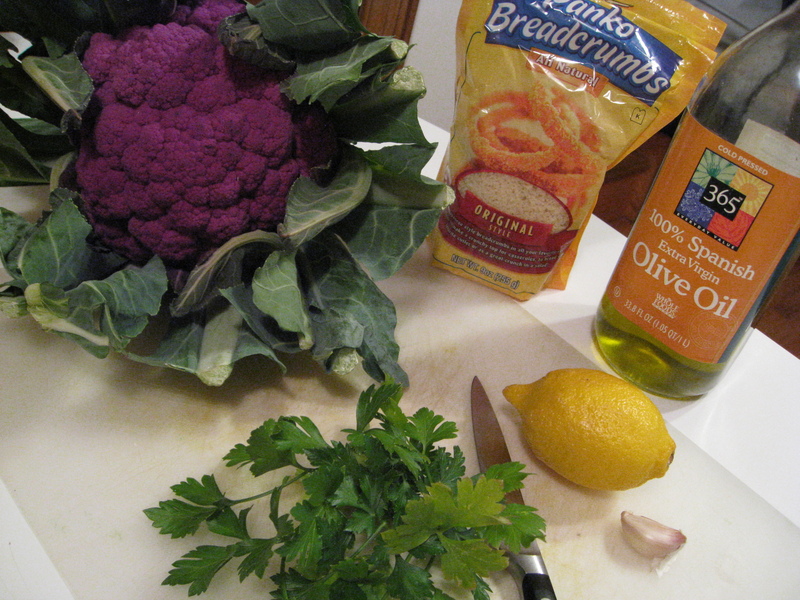 Using a paring knife, cut cauliflower into smaller spears. Place in a large bowl. Add 1/4 cup oil, 1/4 teaspoon salt and pepper; toss to combine. 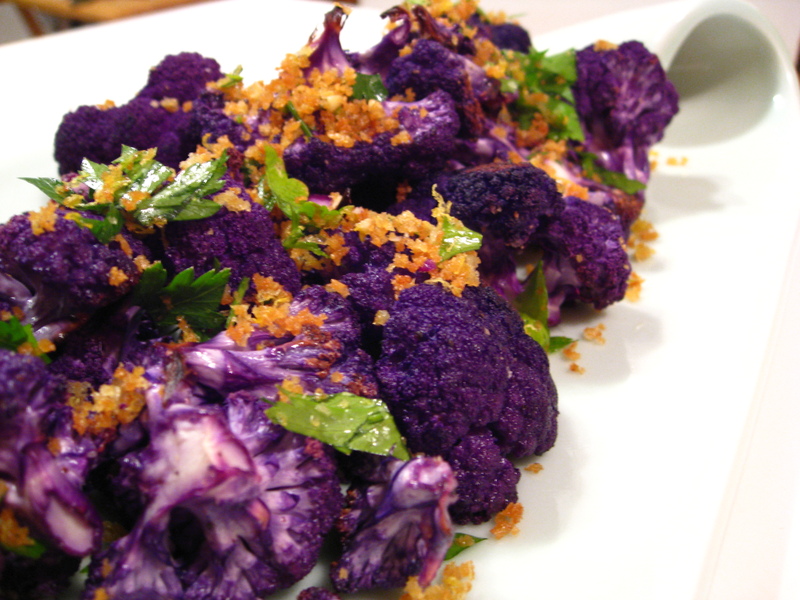 Spread cauliflower out on 2 large, rimmed baking sheets. Roast until edges start to brown, about 20 minutes, stirring halfway through. Meanwhile, heat remaining 2 tablespoons oil in a large sauté pan over medium-high heat. Add panko and remaining 1/4 teaspoon salt and stir to coat in oil. Cook, stirring constantly, until bread crumbs are golden. Add lemon zest and garlic and toss until mixture is very fragrant and bread crumbs are golden brown, about 2 minutes. Place in a medium bowl and add parsley, stirring to combine. Set aside. 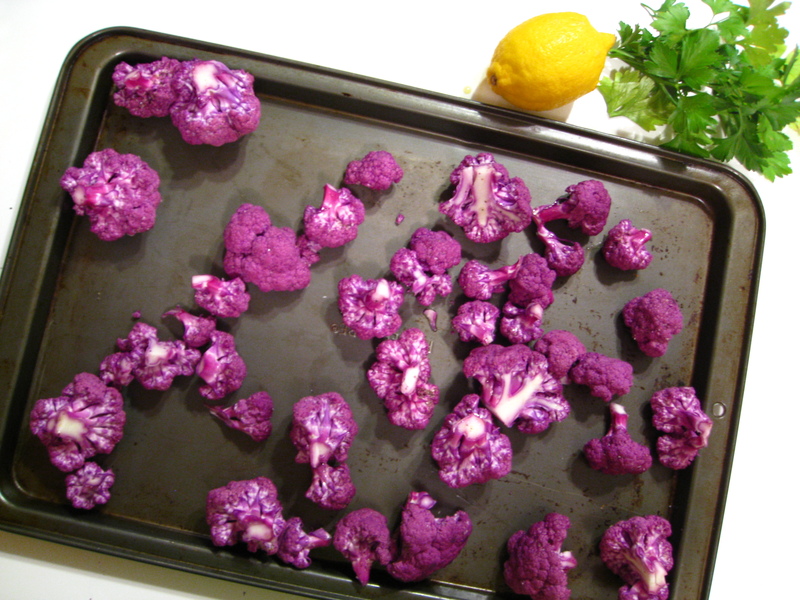 Remove cauliflower from oven and place on serving platter. 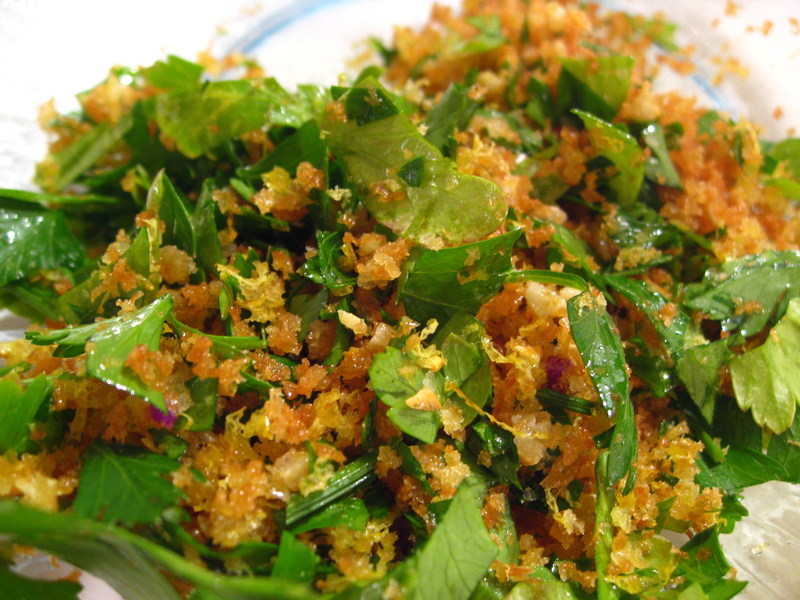 Top with bread crumbs and serve immediately. I’ve never prepped cauliflower. Any tips for for to trim the stem and core? It’s not as tough as it looks. 1) Peel away the leaves. 2) Cut the head of the cauliflower into quarters through the top, exposing the hard center 3) trim away that hard spine from each quarter and the little florets should just fall away or you can use a small paring knife to cut them into bite-sized pieces. 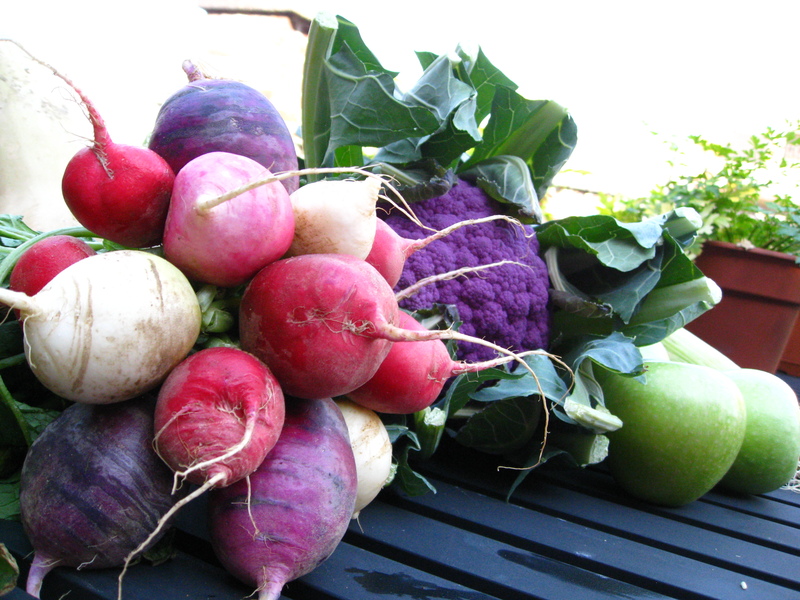 I have not come across purple color cauli b4. Looks amazing! I am with Yin, I need to find some seeds for my garden!